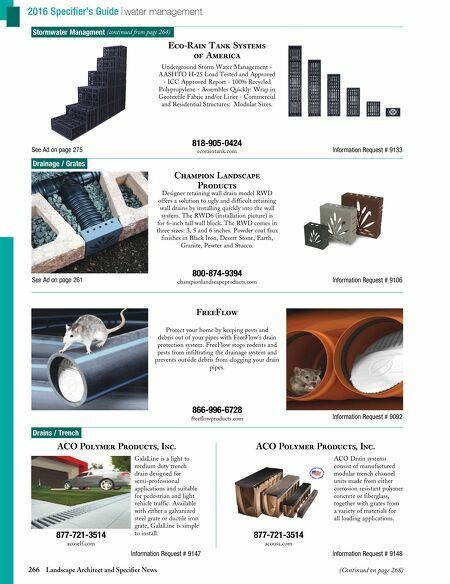 266 Landscape Architect and Specifier News 2016 Specifier's Guide water management Stormwater Managment (continued from page 264) Drainage / Grates Drains / Trench See Ad on page 261 Information Request # 9106 Champion Landscape Products 800-874-9394 championlandscapeproducts.com Designer retaining wall drain model RWD offers a solution to ugly and difficult retaining wall drains by installing quickly into the wall system. The RWD6 (installation picture) is for 6-inch tall wall block. The RWD comes in three sizes: 3, 5 and 6 inches. Powder coat faux finishes in Black Iron, Desert Stone, Earth, Granite, Pewter and Stucco. Information Request # 9092 FreeFlow 866-996-6728 freeflowproducts.com Protect your home by keeping pests and debris out of your pipes with FreeFlow's drain protection system. FreeFlow stops rodents and pests from infiltrating the drainage system and prevents outside debris from clogging your drain pipes. ACO Polymer Products, Inc. Information Request # 9147 GalaLine is a light to medium duty trench drain designed for semi-professional applications and suitable for pedestrian and light vehicle traffic. Available with either a galvanized steel grate or ductile iron grate, GalaLine is simple to install. 877-721-3514 acoself.com ACO Polymer Products, Inc. Information Request # 9148 ACO Drain systems consist of manufactured modular trench channel units made from either corrosion resistant polymer concrete or fiberglass, together with grates from a variety of materials for all loading applications. 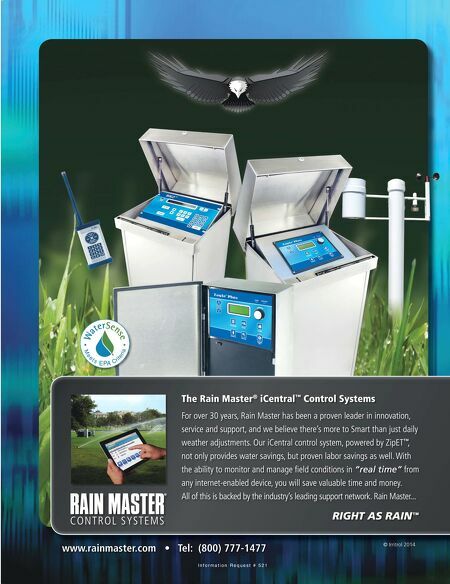 877-721-3514 acousa.com (Continued on page 268) See Ad on page 275 Information Request # 9133 Eco-Rain Tank Systems of America 818-905-0424 ecoraintank.com Underground Storm Water Management - AASHTO H-25 Load Tested and Approved - ICC Approved Report - 100% Recycled Polypropylene - Assembles Quickly: Wrap in Geotextile Fabric and/or Liner - Commercial and Residential Structures: Modular Sizes.